For my second instalment of this fabulous home makeover series I have picked art. You probably thing this is a crazy choice but I honestly love art. There's nothing like an awesome painting or poster to lift the mood of a room and tell everyone about your personality and styles. I'm fortunate enough to have over half of the pictures below already but I felt the need to add them in as I love them that much! 'No Girls Allowed' By Doug Hyde - I have literally just bought this painting. I really never expected to pay as much as I did for a piece of art (less than £500 but more than £250 - eek!) but I fell in love with the vibrant colours and the adorable style that I knew I had to have it. It's going to be put in Max's room when we finally buy a place and will hopefully stay there forever or until he decides he wants death metal posters or something instead. If you haven't seen any of Doug Hydes work then I assure you that you will love it as much as I do. 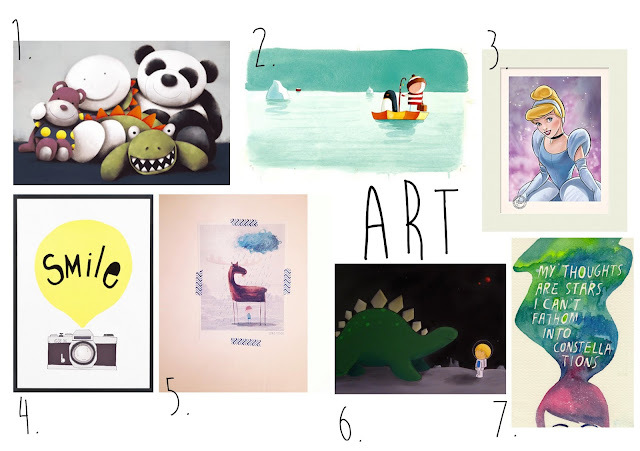 'Lost And Found' by Oliver Jeffers - A limited edition print by my favourite author. Why wouldn't I say no. Again this is a fairly expensive print but maybe when I get an expensive paying job I can invest in one of these too. I would love to hang it in a living room above the sofa as a statement piece. 'Cinderella' By Disney Store - I love this print. Cinders isn't my favourite princess (Belle is the best) but this print surely is better than all the others and it looks so gorgeous that I'd love it in a home office or bedroom. 'Smile Camera Print' by Kerry Layton - Being a photographer I love this. It's so bright and fun that it seriously makes me smile when I look at it. I would love to pop it in a hallway as something to see when I open a door as a nice surprise! 'This Moose Belongs To Me' by Oliver Jeffers - Yet again another Jeffers print. This one was a limited edition print that came in the slipcased hardback copy of the book. I was swift to snap it up because at £12 for the book and a print I couldn't refuse. I've used some gorgeous washi tape to hold it up on the wall in Max's bedroom. 'Dinosaur On The Moon' by Neil Slorance - Neil is a really good friend of mine. I have so many paintings of his but this one is one of the commissions that he did especially for me for my birthday one year. I love it so much and it hangs pride of place in our living room. He did a gorgeous hand drawing of me, Scott and Max for christmas that I love so much. Please search for him and check out his work. He is seriously underrated! 'My Thoughts Are Stars' by John Green x Mei - This amazing print has the quote from the wonderful book The Fault In Our Stars. I bought it on a limited print run that were all signed by John himself and hangs in our bedroom. I love it as it reminds me of my dream of writing and achieving something. It's on half price at the moment for a non signed print and I highly recommend you take a look. Do you like art? Have you got any special pieces in your home?